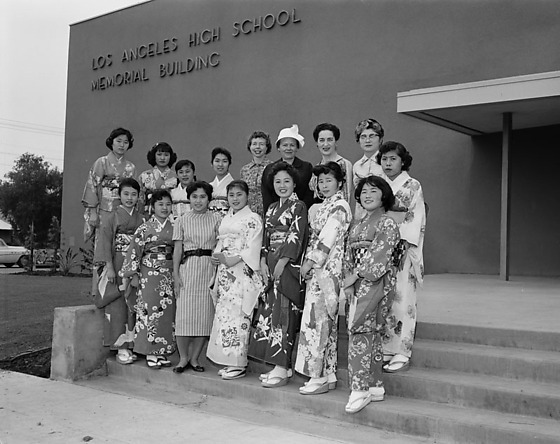 Los Angeles High School Parent and Teacher Association (PTA) International Festival at school in Los Angeles, California, May 26, 1959. 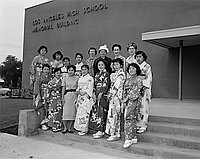 Includes portrait of girls in kimono with Caucasian and Japanese women on steps of high school building, "Los Angeles High School, Memorial Building"; and a Caucasian standing in front of a large group of students, facing the audience who sit with backs to viewer in foreground. Typed on original negative envelope: L.A. High PTA International Festival -- c/o Mrs. Oghima.